A boss at a park keeping the UK's only zoo polar bears said he would not have considered managing the species in captivity just over 10 years ago. The Highland Wildlife Park at Kincraig is home to Mercedes and Walker. Collection manager Douglas Richardson said that previously he would not have thought it necessary to keep the bears in conservation terms. But he said wild populations were now so severely threatened that zoos had a key role in protecting the bears. Two-year-old Walker arrived from Rhenen Zoo in Holland in November this year and is expected to be part of the Royal Zoological Society of Scotland's (RZSS) polar bear breeding plans in the future. Mercedes, who is about 30 years old and shares an area with the young male, is not included in the proposals. Mr Richardson said: "Over the next 18 months to two years we will be building a second, larger polar bear enclosure where Walker will reside permanently as our future breeding male. "A new female will be brought in after Mercedes dies and the bears will be brought together purely just for breeding. "We will be keeping them separate for most of the time, which is how they would exist in the wild." But Mr Richardson said: "If you went back 10 plus years ago and asked me should we be maintaining polar bears in captivity, I probably would have said 'no'. "There wasn't really any conservation need, but now they have become the poster child for climate change." Recent studies have suggested problems affecting the bears could be linked to a changing climate. Scientists led by Prof Cino Pertoldi, of the Polish Academy of Science, said in 2009 their research indicated that polar bears had shrunk in size. The team compared bear skulls from the early 20th Century with those from the latter half of the century. Their study described changes in size and shape that could be linked to an increase in pollution and the reduction in sea ice. This summer, an Arctic expedition confirmed fears that polar bears were preying on the eggs of barnacle geese who migrate to the Solway Firth each winter. Scientists said the bears on the island of Svalbard had turned to the eggs after being stranded on land in the summer months as a result of diminishing ice. The Wildfowl and Wetlands Trust (WWT) said it was concerned bird numbers could be devastated if the situation continued. In November this year, the US designated a "critical habitat" for polar bears living on Alaska's disappearing sea ice. The area - twice the size of the United Kingdom - has been set aside to help stave off the danger of extinction, the US Fish and Wildlife Service said. According to the World Association of Zoos and Aquariums (WAZA) the latest available figures on polar bears in the wild is as of 2008. It said scientists estimated then that there might be 20,000 to 25,000 bears. WAZA said there were 200 polar bears registered in zoos worldwide. The Highland Wildlife Park's breeding programme plans have drawn criticism from animal protection charities. 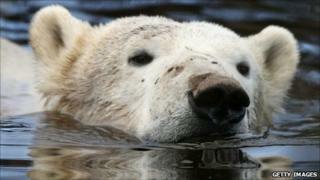 OneKind said any polar bear captive breeding programmes were "inherently flawed". The Born Free Foundation said in 2009 that Mercedes' relocation from Edinburgh to a larger enclosure was welcome but RZSS was "way off the mark" with plans to bring in more bears. Mr Richardson said the park has been reassured by the International Union for Conservation of Nature (IUCN) polar bear specialist group that bears well managed in good zoos have a positive role to play in conserving wild populations. He said: "Mercedes comes from the population near Churchill on the west Hudson Bay. "Because of climate change that will be the first population of polar bear to disappear and that could happen over the next 20 years. "A healthy gene pool in captivity could be used to augment the wild population in the future." He added: "Not for one minute would I suggest re-introducing polar bears is going to be a simple prospect, but if we don't have a well managed captive population we will lose a potentially very important option."